While I stopped actively working on apps for OS 4.x two years ago, it wasn’t until this past month that use of the now ancient OS finally fell below 1%. In my very first post on BlackBerry OS statistics from back in 2009, I expressed my surprise that 49% of users will still on the 4.6 operating system. After a few years of charting these statistics I am no longer surprised my the slow upgrade cycle on BBOS, but it is nice to see this older OS disappear for good. However, the rest of the chart is mainly unchanged from the previous month. This data was collected by BlackBerry World for downloads of the free BlackBerry strategy game Pixelated. 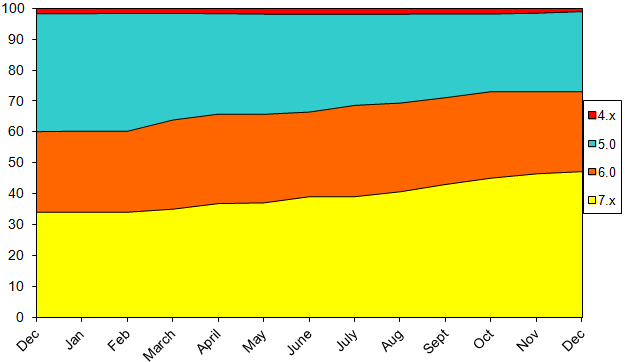 Data shown on the chart is from the beginning of December 2012 through the end of December 2013, and does not include BlackBerry 10 or PlayBook devices.